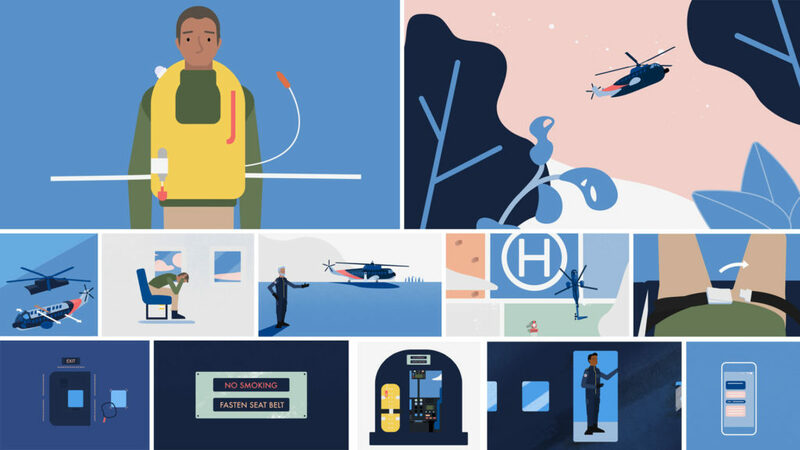 For British International Helicopters, we were tasked with designing and animating a new 5-minute flight safety video that would replace a dated filmed version. It also ensures the content is up to date with the latest CAA approved flight safety video information. The video was to be viewed by a wide array of passengers who we needed to engage with, the 2D animations had to be full of enticing colour and visuals. The videos aims are of course to clearly educate the viewer on the required safety protocols when boarding and flying on a Sikorsky-S61 Helicopter. The script was initially written taking some loose direction from the previously filmed version. We then integrated a number of updates to ensure the content complied with the CAA’s own comments. We also got feedback from British International and the CAA prior to going into storyboarding and style design for the animated video. As with all our animated projects, to ensure a smooth production process we sit down and storyboard the whole video first. With quickly sketched out scenes we were able to think how the animation will play out and compliment any voiceover. It also gives huge value in enabling our clients to feedback before committing time to digital asset design and animation. Once the storyboard is nearly 100% approved we’ll already have a good idea of the direction we are to take in terms of design. We normally create a short sequence for the client to review and give any feedback on chosen colour palette and animation style. For this production we actually animated the first seated safety position, allowing for the client to feedback on character design at the same time. The final scene shown in the video is actually very close to our first test scene, which is always nice to see we’re getting it right early on. Due to time and budget considerations, the style arrived at was kept relatively flat. It also had a great clean look which we were keen to push for. We also ended up avoiding too much complex animation (i.e. there’s no traditional cel animation or 3D). This, of course, helped to speed up production time. The final voiceover was provided by our own Creative Director (Jon Draper) and the client was happy with the delivery. This became particularly useful when the script was still being tinkered with slightly in the final days of the project. We’re really happy with how the final video has turned out and look forward to working with British International Helicopters again in the future.